Indicated are Babelthuap Island, Koror Island, Arakabesan Island, Malakai Island and Urukthapel Island. 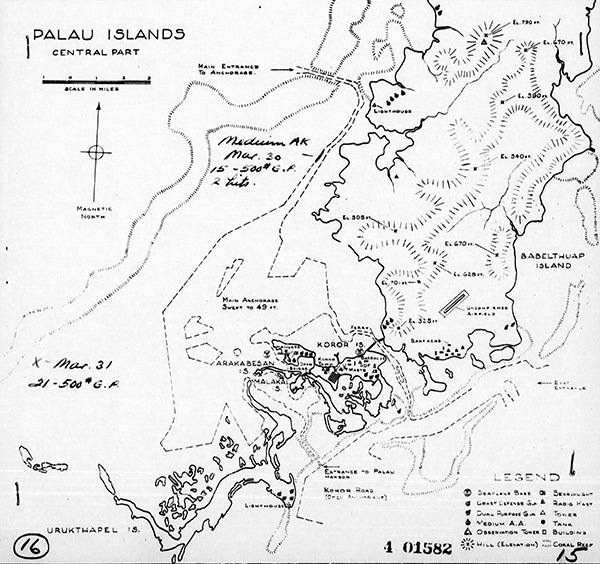 "Unconfirmed airfield" is Airai Airfield (Babelthuap Airfield, Palau International Airport) near Airai and Aimeliik State in the southern portion of Babelthuap Island. Also noted is the East Entrance and entrance to Palau Harbor (Palau Anchorage, Koror Roads). Annotations indicate March 30, 1944 and March 31, 1944 mission results from U. S. Navy VF-23 strikes.